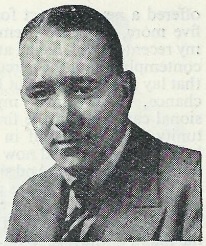 Nicholas Blake, aka Cecil Day-Lewis, the Poet Laureate from 1968-72 wrote twenty two detective novels. The most renowned seems Head of a Traveller, although The Beast Must Die is also very popular. Obviously I haven’t read or reviewed these – but I have reviewed The Case of the Abominable Snowman (excellent) and The Worm of Death (good). I figured it was time to grab another off the shelf, and so we come to End of Chapter. 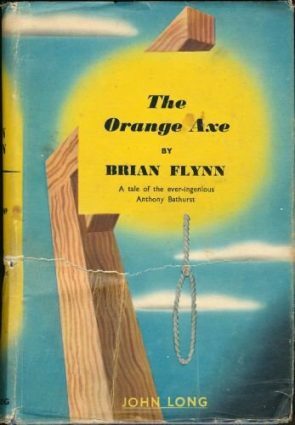 A publishing house calls in Nigel Strangeways, seemingly a professional detective here, although I recall him being more of a nosey amateur in other books, because there has been some shenanigans going on. An autobiography needed a couple of libellous passages removed before being sent to the printers, but a sneaky so-and-so took the opportunity to remove the editing instructions at the last minute. No-one notices until the book is published and the damage is done. After a bit of snooping, the next thing that Nigel discovers is the dead body of Millicent Miles, an authoress whose autobiography the company was also publishing. Did this have anything to do with the sabotaged manuscript? Or does it relate to a secret contained in her book? And what was the murderer typing in the office after he had cut Millicent’s throat as the blood oozed around his/her feet? 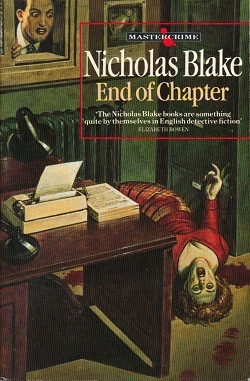 As with the previous books that I have read, Blake clearly defines his list of suspects – about five or six of them and refuses to let Nigel consider anyone else for the crime. That’s fair enough – there’s some business with the fact that it had to be someone in the building at the right time, so the limiting isn’t unnatural and it allows Blake to develop each of the characters properly. Most of the development works well, but, as with The Worm of Death, he is less than convincing with the less reputable members of society, here embodied by the wonderfully named Cyprian Gleed, the victim’s layabout son. Indeed, an action attributed to Gleed by the end of the book is so bizarre and unnecessary that you’ll find yourself double-checking that it actually happened. No reason is given for it, certainly, except that he’s a bad-un. Strangeways is rather an entertaining chap to lead you through the story, and I especially enjoyed his banter with his partner Clare – not many partners would willingly pretend to be a dead body for you in order to trap a murderer. He is a little callous at the end of the book when he rather nastily breaks down the murderer with the sort of methods that you need if you haven’t got any evidence. Unnecessary but designed to give a sort-of happy ending. A case of the plot taking over the characters, but that’s only a small niggle. Back to the main story, and, in a similar vein to The Worm of Death, the mystery gains a certain inevitability as the characters progress and I doubt anyone would be surprised by the revelation of the murderer. The clues are there and there’s a nice double-bluff on one part of the plot, but unlike The Case of the Abominable Snowman, Blake fails to find a particularly clever twist with the plot. It is simply a good, well-written murder mystery. And what’s wrong with that? With exception of the excellent The Widow’s Cruise, I have yet to venture into these very late stories (i.e. post-1950). But I can highly recommend most of the earlier novels, if you haven’t read them already. 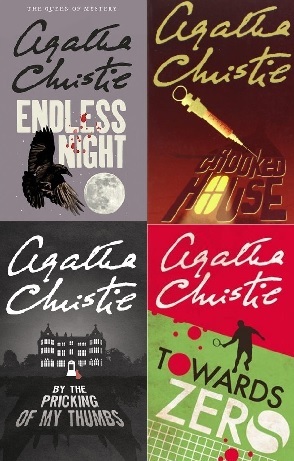 They’re great novels even if they aren’t always great detective stories and the characterization is always superb. Head of a Traveller is a tragic masterpiece and the unusual, almost open ending is very effectively done (really must re-read this one), but I also think highly of There’s Trouble Brewing – even though I stumbled to the solution fairly early on in the game. The plot is still cleverly constructed (perhaps one of his best) with a great cast of characters placed in a memorable setting. The Beast Must Die is good with an interesting premise, in which we follow a father on his hunt for the man who killed his only son in a hit-and-run, but in spite of the critical acclaim, it’s, IMHO, not one of his best. Digging back in my memory, I think it suffered from an unsuccessful attempt at combining the psychological novel with a story of detection, but neither was given the space required to reach their full potential. A Question of Proof is an excellent debut, in which Strangeways investigates a murder at a public school and at times feels like an Edmund Crispin novel (like when he’s given a set of tasks, as part of initiation ritual, to become a member of a school club in order to pry information from the students). There’s also a clever impossible stabbing later on the book. I just stopped typing to see what I just wrote and it wasn’t my intention to ramble on like that – so I will stop littering your comment section. Oh, and be warned, I bought my first Hugh Corbett mystery and I might have to break the promise I made on my blog and read this one next. You should post that over on your site. Very informative. You’re right, you’re guaranteed a well-written book from Blake, although as I said, he has an odd opinion of… what would be the word – bohemian characters? Still, this won’t be the last of his works that I’ll be reading. I’ve never read any Nicholas Blake but would love to give him a go. They don’t tend to come up in second hand book shops. Maybe I need to look on the internet. I love your Sherlock Holmes wallpaper. Abebooks has loads of cheap copies. As I mentioned in my review, my favourite is The Case of the Abominable Snowman. Highly recommended!